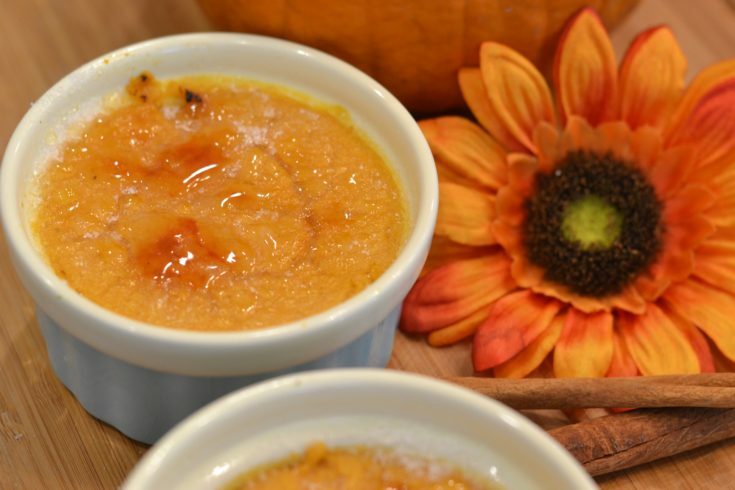 This Instant Pot Pumpkin Creme Brulee is a no-fuss recipe that will leave you swooning. You get the flavors of fall in every single bite of this creamy brulee. Crack into the hard caramelized sugar top with one fancy treat awaiting you. 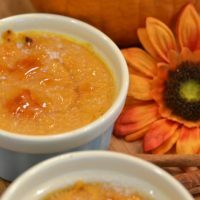 The Instant Pot Pumpkin Creme Brulee is the must make ; itrecipe this fall season. One of my favorite moments in my Instant Pot cooking journey was the first time I made Instant Pot Creme Brulee. I thought I had died and gone straight to heaven after tasting how delicious it was. It is such a simple recipe, using simple ingredients and takes barely any time to whip up in your Instant Pot. Creme Brulee is my favorite special treat dessert when we are at a fancy restaurant, and now I can eat it any time I want. I decided with all of the pumpkin treats I have been making, it was only suiting that I make Instant Pot Pumpkin Creme Brulee and boy is it delicious. I love all of the pumpkin treats that go along with the beautiful fall weather. You will want to try our Instant Pot Pumpkin Cheesecake. With the holidays upon us, I wanted to test out some recipes I might serve up at our Thanksgiving and Christmas feast. While I love pumpkin pie, I tried to step out of the box with more pumpkin recipes. I mean the grocery stores are packed with all things pumpkin, so my mind won’t let up. You get those fall vibes in each bite with a subtle pumpkin flavor, creamy texture, and a sweet, crunchy shell. You still get all the aspects from a classic creme brulee but with an added pumpkin taste. Creme brulee is a custard base dish that is topped with carmelized sugar. Inside is a creamy and thick custard, that melts in your mouth. You serve it slightly chilled or warm (whichever you prefer) and use a torch to heat the sugar on top, to give it a nice crust. So you will break into the coating to a silky and creamy center. My Pumpkin creme brulee is just like a classic, but you have added pumpkin flavor into it. I am telling you guys if you love the classic you will love this new and upgraded version! Let’s face it not everyone has a little kitchen torch tucked away in their cupboard! If you do not have a kitchen torch, you have other options to melt that sugar granule on top, to give it that crispy texture. The most realistic and practical method is to broil. Just turn on the broil on the oven and tuck your creme brulee in and let it crystalize. Just watch it carefully as it will happen quickly. You might not get the same texture, but it will be close. You can indeed freeze your brulee! Just take your baked brulee and wrap them up and freeze them. When you are ready to serve just remove it out of the freezer, and let them thaw a bit. Add your sugar on top, use your torch or broiler, and then crystallize the sugar. Serve at whatever temperature you like! I hope you guys love this recipe as much as we do! Make sure to let me know what you think in the comments below. 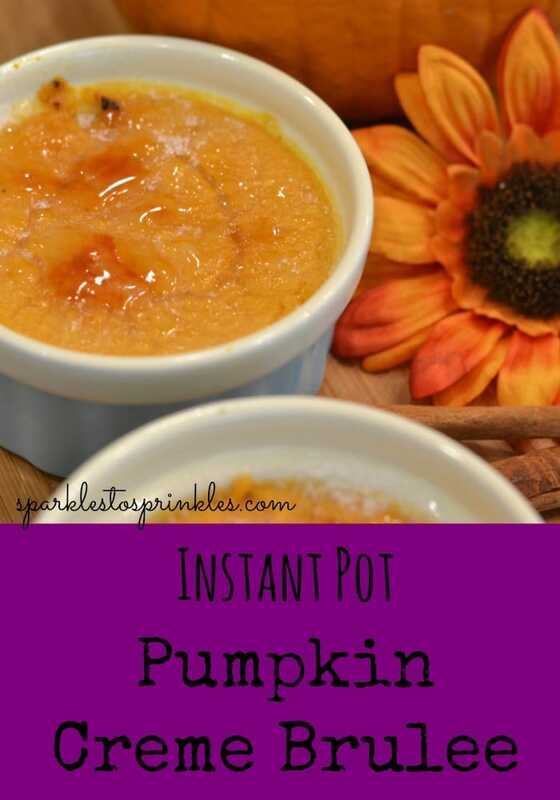 This Instant Pot Pumpkin Creme Brulee is so delicious you will not believe you made it in your instant pot. This is a dessert that would be served at the fanciest restaurant. Add in cream, pumpkin puree and vanilla. Whisk until well blended.